INVITE A FRIEND new or not new to golf! The afternoon starts at 2:30pm with a 30-minute “Quiet Eye Putting Clinic” where you will get ideas and drills to improve your putting. FIRST TEE TIME is 3:15pm and allows you 15 minutes to get yourself organized and ready for the game. 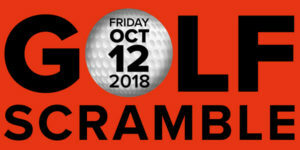 The winning team will have a chance to win $1,000,000 and we shall all share the joy of the day with “after golf” refreshments at approximately 6:00pm. COST: $35.00 to be paid in the Pro shop upon arrival. A two-person scramble involves teams of 2 golfers. Each team member tees o on every hole and after the initial tee shots, the team selects the best shot out of their teammates and then each team member plays their next shot from that spot. This continues throughout the rest of the shots on the hole including putting. A player is allowed to place the ball within one club length of the spot of the best shot, but not nearer to the hole. Record the team score after each hole.